A high quality green roof membrane that acts as a drainage layer for green roof systems. PermaSEAL 8 Green Roof is a high quality green roof membrane, ideal for creating an attractive and healthy green roof. 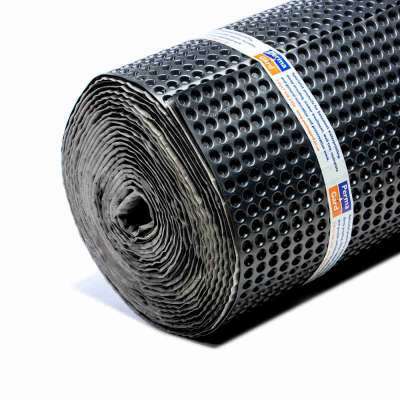 Manufactured from premium HDPE, it provides a drainage layer and filtering layer all in one membrane. It can be used in both extensive and intensive green roof systems on houses, sheds, garages and larger commercial projects. Our PermaSEAL green roof membrane has an integrated geotextile fabric firmly bonded to the membrane. This prevents slip and compression of the fabric against the membrane. This geotextile layer also filters out fines and other particles to ensure your green roof can thrive. This bonded geotextile filter layer also saves time on installation compared with laying a separate and loose geotextile layer. This green roof membrane is suitable for both pitched and flat, intensive and extensive systems. It is also suitable for walkable and drivable deck paving drainage applications. Typically PermaSEAL 8 Green Roof is used in conjunction with a primary waterproof coating above roof decks on flat roofs and pitched roofs. Installation is straightforward. We supply the membrane in 20m² and 40m² roll sizes - this mean the membrane can be handled easily by one person. This makes it ideal for DIY green roof installation as well as professional installation. PermaSEAL 8 Green Roof Membrane is a high quality and long-lasting product. It has a life expectancy equal to the design life of the structure (DIN 9001:2000) and is guaranteed against deterioration for 30 years. As an inert product, it is highly resistant to water, alkalis, saline solutions and organic acids and is not affected by minerals. It is also resistant to bacteria, fungi, and other small organisms which is important for green roof membranes. Once a primary waterproofing layer has been applied to the concrete roof deck or screed, and a slip layer if required, you can roll out the green roof membrane across the length of the roof. Next cut the membrane to size. 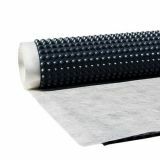 You can overlap the ends of two rolls of membrane, connecting the cavities. We also sell our PermaSEAL Jointing Tape if you want additional root protection. PermaSEAL Root Barrier & Separation Layer – used as a slip layer/root barrier membrane between the primary waterproofing and PermaSEAL Green Roof membrane. MB2K Flexible Waterproofing Compound – the primary waterproofing applied directly to the concrete roof deck or screed. Permagard – Providing solutions. Inspiring confidence. It is important that you select the correct green roof membrane to suit your requirements. Our green roof membrane functions as part of a wider green roof system. Please contact our technical department if you have any questions. Call us on 0117 982 3282.